Maku has trained in multi styled yoga focusing on Hatha as well as the therapeutic aspects and alignment. 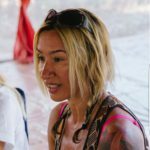 Her aim is to create a vehicle through the Asanas to connect the body with the Prana with the aim of unifying both. In addition to the Asanas and Pranayama she also introduces yogic philosophy, mantras, mudras and meditations into the classes. An early interest in yoga and meditation has led her to teach yoga in India, Spain and now in the UK and she enjoys attending meditation classes wherever she goes. She is grateful for the opportunity to serve as a yoga teacher and always considers herself to be a student on this great path. Beyond yoga Maku has a passion for Kung Fu, meditation and travel. During her time in India she obtained her Reiki level II and her 200 and 300 hour teacher training in yoga. She is also a qualified Bach flowers practitioner and reflexologist, a sports massage, Thai table massage and chakra therapist.